and you will pass what is possibly the most famous Inn on Dartmoor. The Warren House Inn stands isolated and remote high on Dartmoor. 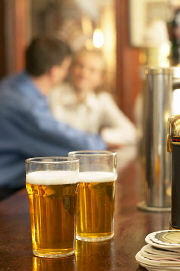 At 1425ft (434m) above sea level, it is the highest Inn in Southern England and also said to be the loneliest. Originally built to serve the busy local tin mining community, the Inn was always a favourite resort with miners from neighbouring Tin Mines, including Golden Dagger, Vitifer and Birch Tor Mines. During this time it must have been a bustling place with the mining and passing travellers. 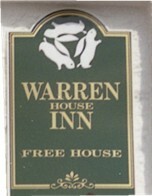 The last commercial mine (Golden Dagger) was closed in 1930 thus leaving the Warren House Inn lonely and exposed. It survives today on passing trade and tourism. as is much of the surrounding area; it is a fully repairable leasehold property with the landlord being totally responsible for all maintenance and repairs. It has no mains facilities at all and is totally self sufficient. Electricity comes from one of the two diesel generators, one is 52kva and the other is 30kva. Gas is used for cooking and this is LPG from a storage container. Water is gravity fed from an underground spring and the sewerage system is a self contained septic tank. 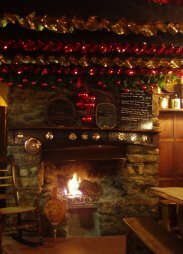 over the ever changing face of Dartmoor and you will be assured of a very warm welcome, not least from the fire which is said to have been burning continuously since 1845. The present Inn was built in 1845 and the builder's slate plaque is set into the eastern gable wall, the date is curiously specific and reads “I Wills-Sept 18 1845” this marks the completion of the new building. This replaced the original building which stood on the opposite side of the road where the peat fire was said to be “always in” and according to folklore, the then landlord transferred smouldering peat (vags) from the original building, to the hearth in the new one. This tradition lives on, however today we do not burn peat (vags) but wood from neighbouring farms. the Inn was named New House. The name Warren relates back to the surrounding rabbit warrens which were extensive in the area and presumably a major part of the miners and local diets. The sign above the front door is of three rabbits (or hares?) chasing each other. They have only three ears between them, but joined to look like two each. This is the assay mark of the Vitifer tin mine whose degenerating remains may be found in the valley below. Pictures of the three hares are the subject of many projects and examples of it have been found in churches and ancient caves around the world. and legends attached to the Inn including the “Salted down Corpse”, “Jan Reynolds” who sold his soul to the devil and dropped his cards near the Inn. The ancient Bronze age settlement remains of Grimspound is visible from the Inn (although not on a foggy day!) The Dartmoor Poet Jonas Coaker was once a landlord. 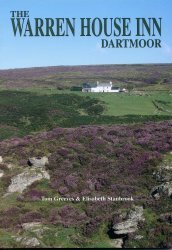 of the history and you can read all about the history and tales of the Inn in our own book by Tom Greeves and Elisabeth Stanbrook, which is on sale at the bar.